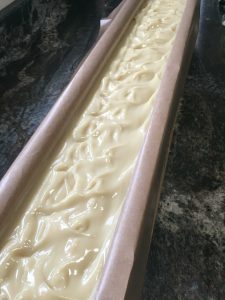 Today I’m making soap…I have a few crafts fairs and events coming up and the soap needs time to cure. 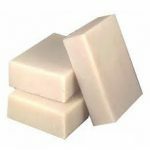 So what better time to take some pictures to show you how you to can make natural soap at home. The batch I’m making today will be Tea Tree Soap, there will be no color added making it an easy one to start with. I will be using my most used recipe with Olive, Coconut and Palm Oil. This recipe will give you a great bar of soap that will lather and last. The first thing to do is get that protective clothing on and cover your area with newspaper or a plastic sheet to protect it. 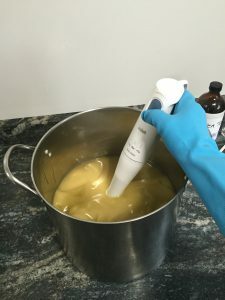 Once you have your safety glasses, apron and gloves on and your soap making area is ready your can start by measuring out the oils to be used. I measure mine in grams, but your can use ounces if that is what your soap recipe calls for. I tend to go on soap making sprees, so I measure all the hard oils ahead of time and put them in ice cream buckets, that way when it’s time to start making soap I just empty a bucket into the stock pot and add my liquid oil. It’s important to be accurate with your measurements; too much or too little can have an effect on the way your soap will turn out. 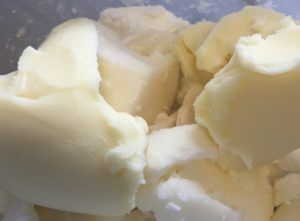 There is nothing worse than spending the time and money on making a batch of soap and having it not harden up or turn out to hard that it becomes brittle and breaks apart. 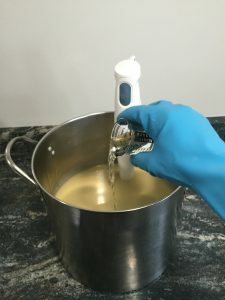 You can measure your oils separately and then add them to the soap pot, or if you have a large enough scale or a scale with a tare button, measure everything into your stock pot. Once all the oils have been measured and put into the soap pot. Set the pot aside or put it on the burner ready to go…..now on to the lye/water mixture. 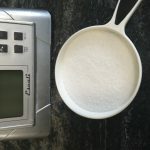 I always measure the lye (Sodium Hydroxide) by grams and my water in cups, your recipe may be in ounces so use what the recipe tells you. The recipe will let you know how much lye you need for your oils. 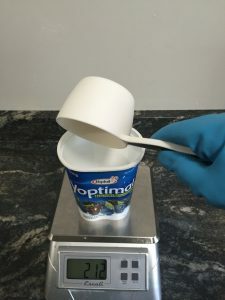 I use old margarine or yogurt containers to weight the lye and a measuring cup for the water, be sure to have your safety glasses on and wear gloves. You want to avoid the danger of a lye burn, as careful as you can be it does sometime happen. 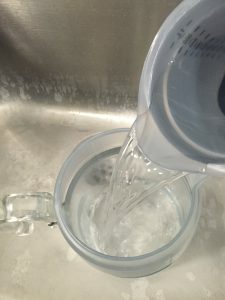 Always pour the water into your container first!! I use an old glass pyrex coffee pot for my lye/water mixture. I’m always hunting for these at garage sales or second hand stores, the lye (sodium hydroxide) will etch them in time so I replace them as often as I can. I always put my lye/water container in the sink, because you never know. If it were to break…well I don’t even want to think about that. You can use other containers as well, but I have always put whatever my lye/water mix is in, into something else just in case of spillage. “Always add the lye to the water” it can cause a volcano like event if reversed. 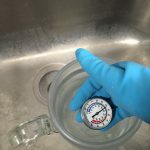 Now take your measured lye and very slowly pour it into the water and stir continuously while standing back to avoid the fumes. This solution will heat up. Keep stirring until the mixture becomes clear, then you can go back to your oil mixture. Now that your lye solution has heated up you will leave it to cool down to between 95 and 105 degrees fahrenheit. For more information on lye (sodium hydroxide) click on this link. The oils will need to be heated up now. 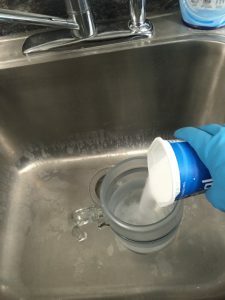 I use a hot plate and simply place the soap pot on it. The oils should be heated up to approximately 120 degrees fahrenheit. 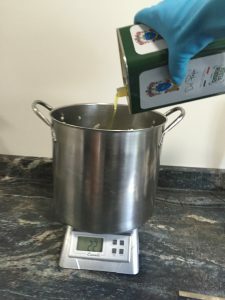 Once they have reached this temperature the pot should be removed from the hot plate and left until the oils have cooled down to between 95 and 105 degrees fahrenheit. The key is to add these two liquids to each other when they have both reached the same temperature. That temperature being between 95 and 100 degrees. When you are waiting for the oils and lye solution to come to temperature, this is a good time to line your mold. When both the lye solution and the oils have reached the required temperature it’s time to mix them together. I use the stock pot so I can add the lye to the oils (there is plenty of room in this pot). When the temperatures are good slowly start to pour the lye solution into the pot with the oils and stir by hand mixing up the oils and lye solution. You can continue to mix with your wooden spoon until it traces (looks like pudding) but it can take a long time. I use a stick blender. For more on trace – go to What is trace? When the soap mixture starts to trace this is the time to add scent. For this lesson I am not adding any color, just Tea Tree Essential Oil. Measure the essential oil, add to the soap mixture and mix up well. 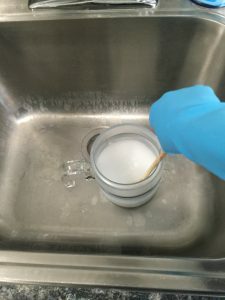 Stir real well to make sure the scent is mixed in well, your soap mixture should thicken up a little more and then it’s ready to pour into your molds. Once the soap has been poured into the mold, it should be covered with a piece of cardboard or something similar and then an old blanket or towel placed over it. This keeps the heat in and starts the soponification process. 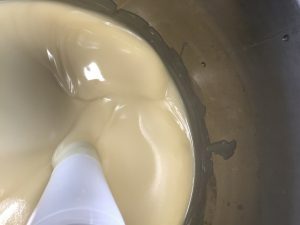 This is the process that turns your ingredients into lovely soap. I cover this mold with a piece of cardboard that has been cut to fit over the top nicely, I then cover that with an old wool blanket. Now it’s time to wait, you can check your soap in 24 hours. If it is still warm leave it for another 24 or until it is cold. The time can depend on the size of your mold. With my molds I leave my soap for 2 days. Once the soap is cooled it can now come out of the molds, cut and placed to cure for 4 weeks. During the curing period it is important to turn your bars making sure that all sides get exposed to the air. This will ensure they cure well. I hope you enjoyed these step by step instructions. If you have any comments or questions please feel free to leave them here. I am very impressed with the details of the instructions. The pictures are very helpful in what seems like a tedious process. I also love the soothing lavender color that occupies the header. I instantly thought of lavender soap which is extremely appropriate!! Keep up the good work! 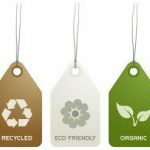 This is very interesting and even though I have never even thought of making my own soap before, your post is detailed enough that I could probably try making my first soap bar. But did I miss something, I am just unsure what lye means/is? And I guess you can add scent you want? Oh can you make it smells like candy?! Thanks for the info. 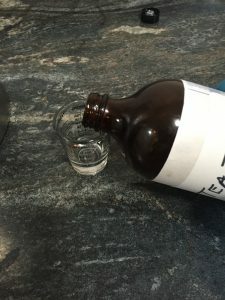 Lye is also known as Sodium Hydroxide. 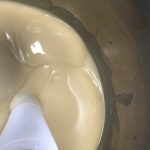 It is essential to soap making as the lye/water solution when mixed with the oils creates a reaction called saponification. 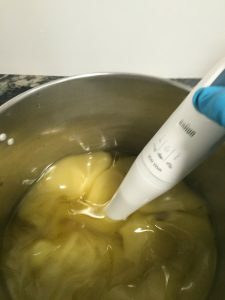 Here is a link for some more detailed information for you http://makingsoapnaturally.com/lye-soap-making You can add whatever scent you choose, that would be added at trace. There are many scents out there including candy. 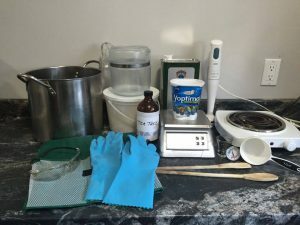 Hi, great tips on how to make your own soap. I did it once in chemistry lab and remember that it was a long process. Just a question, where do you find your ingredients? I can’t find sodium hydroxide at our chemist, is there somewhere specific you find it? It’s very clear instructions, you make it sound easy. Thanks for the info! Hello Ninene, I get my ingredients from different suppliers depending on what I am ordering. As for the sodium hydroxide. You can get it at most Hardware stores, but I’m not sure it is the same quality as the sodium hydroxide that the soap supply stores offer. 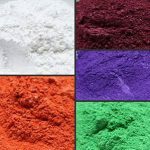 Most suppliers of soap and candle making supplies will be able to sell you sodium hydroxide. However they can not ship it via mail, when I order mine it comes via greyhound. I hope this helps to answer your question. Thanks for stopping by my site. I LOVE THIS POST! Iâ€™m always looking for fun new ways to work with natural body products. I use to make my own lotions but Iâ€™ve never made my own soaps. Do you make them for yourself? Or do you sell them? Iâ€™d really love to try your method. Thank you so much for sharing this recipe! Great instructions. Very detailed and the pictures were a bonus. I love natural soap but always felt like it would be an overwhelming process to produce my own. Your instructions made me feel a little more confident about making my own soap. It’s great that you have links to the supplies as well. Thanks. Hello Tugarcia, I’m glad this article gave you more confident in making soap. It’s so nice to have your own natural soap, and knowing what you are putting on your skin. Hi Teresa. I was wondering if you can leave out certain oils. I’d only like to use a few instead of all of them. Will it harden the same? What are your thoughts. Thanks. You can use whatever oils your would like for making soap. I do one bar that just have Olive oil, so yes you can. 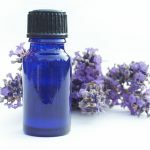 Here is a list of soap making oils you can look at and a link to the Olive oil soap recipe.